The Jet Manufacturing Company has been manufacturing machinery since 1958 including the Jet Table Saw. Each year the quality of Jet machines get better and better. They began making woodworking equipment in the early 1980's. Over the years the colors of the tools have gone from blue, to green, to orange, and finally to the famously trademarked White that you see today on most Jet products. The Jet Table Saw models below are the current offerings in the Jet line. Smooth Speed™ belt drive transmission. If you're looking for a jobsite saw that's both powerful and portable, look no further than the all-new JET® B3NCH 10" Jobsite Table Saw with stand. 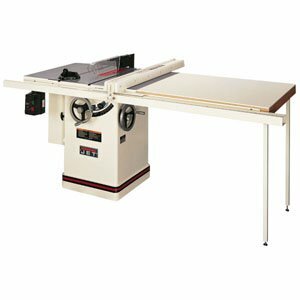 This table saw features a 15 Amp soft star..
Jet JWTS-10 1-1/2HP WRKSHP TBLESW Surface ground cast iron table with miter slots and beveled edge provides a sturdy, flat work surface Steel extension wings increase your work a.. The new JET® ProShop Tablesaw features the details you've come to expect from a high end cabinet saw; in the compact design of a contractor-style saw. What ever your current or future shop needs. EXCLUSIVE ProShop fence system with T-square design Integrated arbor lock allows for quick, safe and easy blade changes JET downdraft table with exclusive design (patent pending), draw.. The new JET® ProShop Tablesaw features the details you've come to expect from a high end cabinet saw; in the compact design of a contractor-style saw. What ever your current or future shop needs, .. The new JET® ProShop Tablesaw features the details you've come to expect from a high end cabinet saw; in the compact design of a contractor-style saw. What ever your current or future shop needs, the ..
CLOSED STAND SUPERSAW XACTA® Fence II systemwith T-square design and HDPE sideboards Sliding tableFor accurate cross-cutting and miter cuts Enclosed cabinetChannels dust to a 4" port ..
CLOSED STAND SUPERSAW XACTA Fence II systemwith T-square design and HDPE sideboards Sliding tableFor accurate cross-cutting and miter cuts Enclosed cabinetChannels dust to a 4 port for fast, cle..